See who can get the most basketballs in the hoop! We have several different hoop sizes and heights to accommodate basketball fans of all ages. If you are looking to add even more of a challenge, see how many times you can make it in in a minute! Enjoy America’s favorite pastime with our Football Field Goal Toss. Hurl the football into the goal and see who can get the most field goals. This activity is perfect for sports fans of all ages, so, parents, don’t be afraid to test out your throwing arm! Do you think you have an arm capable of pitching a “home run”? 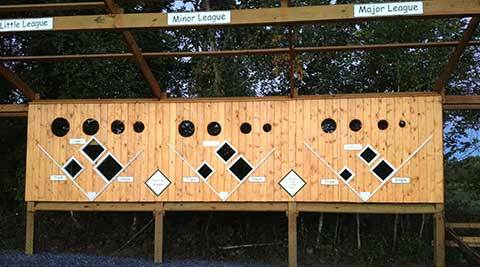 Choose your level of difficulty: Little League, Minor League, or Major League, and put your skills to the test.